For anyone interested this book is available at Amazon. The interior is full color and a glossy cover! Why has the VMS garnished so much attention from amateur and professional cryptographers, programmers, linguists and art historians? Truly I believe that at first glance by all it looks like the VMS text can be read. That in the moment of the first glance it looks simple, but once fully invested the person realizes the VMS is highly complex. For what it’s worth, what I have found is the translation is not all that exciting. Language frequencies have been applied to the VMS without finding any consistent language that fits a straight across translation. This has led some to believe the VMS is a hoax or an invented language. I believe the latter! What would cause so many failed attempts at decoding the VMS? The author would invent a language as a cipher of scrambled letters replacing words to numbers in the invented language and to further complicate it, make it look like a known language. What I propose is that the VMS glyphs have been strategically placed and that the letter values being numbers are of Middle English Gematria origin. This is known as ordinal gematria. Which must also be an "invented" substream of gematria, because gematria is always used in combination with Hebrew. Stellar, your theory is unscientific as many of our members have tried to explain to you many, many times, and I do not stand behind the commercial promotion of such a product on this forum. But that is my personal opinion. I will ask for the other mods' advice on what to do with this thread. What amount of science has decoded the Voynich Manuscript? The book does contain statistics which support the use of Ordinal (A=1 through Z=26) Gematria as a method of interpretation. As a member here I have contributed a great deal towards another way to look at how the Voynich Manuscript could be written. I don't believe there should be favoritism over ones body of work vs. another. I respect your work and do read your threads and posts. There will be no favouritism towards one work or another on this forum, Stellar. 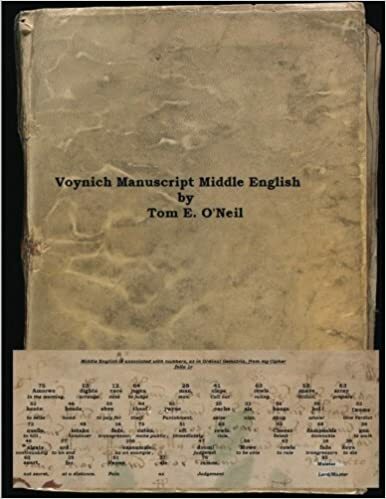 If you have published a book on the Voynich you are welcome to announce it here - once. Commercial self-promotion is of course not permitted on the forum. Please edit your original post to include standard publishing information - date of publication, author(s), publishing house, ISBN and number of pages. The GREEN or the BLUE pill? Sorry, I forgot my magnifying glass and my Buddy Holly glasses are in need of an upgrade..
Westy, this "author" also has self-published books saying the VMS is Latin and the VMS is from the house of d'Este. A new book every few months with a completely different theory. He says it's gematria, Welsh, Latin, Middle English... which one is it? In addition to what JKP says, this prolific author's "ciphers" always work in the same way: he comes up with a method that allows him to pick from a massive amount of translations. Then he decides what a page should be about. Finally he generates some pseudo language about his chosen subject. If you want the VM to be a manual for Windows Vista, he could make it happen. Your imagination is the only limit. A pariah is a person. This word cannot be used for a piece of work. The person has been ejected from this forum by the moderators (several times), so he could be called a pariah, an outcast, but this seems overly dramatic.